(by J.R. Broome) A brief biography of Scotland's greatest reformer. (by J.R. Broome) A brief biography of Germany's most famous reformer. (by J.R. Broome) A group of men who fled abroad to escape persecution and whom the Lord used to further the work of the gospel in this country after the death of Mary in the reign of her sister Elizabeth. This group of exiles numbered at least eight hundred and probably more. (by J.R. Broome) The moving account of four of the 16th Protestant martyrs who died in the fires of persecution for the cause of God, the Truth and religious liberty: The Bishop of London, Nicholas Ridley, The Bishop of Worcester, Hugh Latimer, The Bishop of Gloucester, John Hooper, and the Royal Chaplain to Edward VI, John Bradford. The sacrifice they made must never be forgotten. (by J.R. Broome) The moving account of one of the 16th Century Protestant martyrs who died in the fires of persecution for the cause of God, the Truth and religious liberty. The sacrifice they made must never be forgotten. 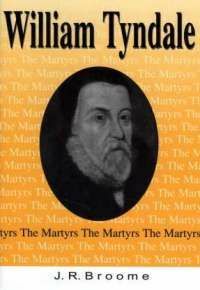 (by J.R. Broome) The story of that true servant and martyr of God, William Tyndale, who for his notable pains and travail, may be called the Apostle of England in our later age.